It’s been a couple of days since our account was upgraded to winter 07′ and we’ve only touched a fraction of the upgrades. The feature that jumps out immediately is the related list hovers, making it much easier to navigate to the information you need on your account and contact tabs. The upgraded calendar view is very nice, and also comes with hover pop-ups to make viewing much quicker and clearer. The task pop-ups are great – I only wish there was an easy way to go back and “enable” all of the previous tasks created in our organization. I started playing around with the console, but so far I’m not seeing how this feature will benefit our company. I’m sure this is great for call centers and other high volume applications, but for now I’ll move it towards the bottom of the list of upgrades. The validation rules should be extremely helpful, I’m wishing we had these when we implemented our custom fields but we’ll gradually go back and put them in where most needed. 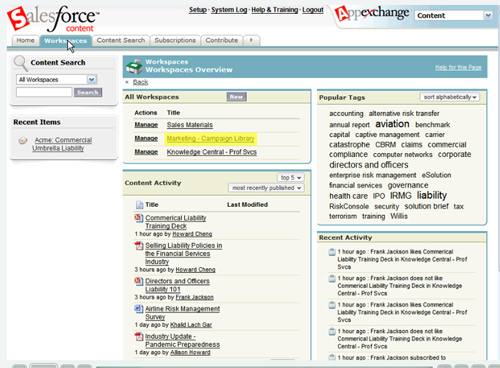 There are tons of new features, all of which can be found here: http://blogs.salesforce.com/features/winter_07_release.html. I highly recommend downloading the full 215 page user manual. It’s been rather quiet on the blog front, myself included. I’m hoping all these great new features sparks some new discussions and creative implementations.